As someone who has been writing about environmental issues on the internet since 2006, (has it really been that long?) I often get asked what I think our chances are against climate change. And most of the time, the questioner does not like my answer. 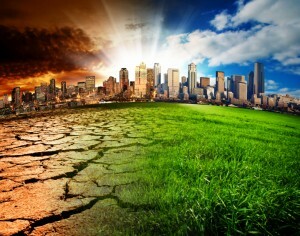 Here’s why: I don’t think we (life on Earth) stand a chance against climate change. If we had acted 50-60 years ago when the facts started showing themselves to our scientists, then maybe we could have done something. We should have worked diligently on coming up with a solution/workaround that would have enabled us to change our lifestyle to slow it down or even reverse it… but we didn’t. And now look at the mess we are in. Because the power companies, lobbyists, and the wealthy are now the ones that make all the decisions for the 99% rest of us, climate change is going to destroy life on Earth – and it’s probably not going to take that long. When money is your “leader”, it’s hard to get someone to do the right thing for anyone else. And that’s exactly what is happening now. Fracking, trans-national pipelines, and deep-sea drilling, the stopping of wind and solar power plants, and the lack of our political leaders to stand up for us means that the Earth is going to continue to be plundered until there just isn’t anything left. Period. No matter how many lightbulbs you change out at your house, no matter how many non-toxic laundry detergents you buy, and no matter how many Priuses are on the road, our actions will not save life on Earth. It just won’t. The things we do are tiny dots on the landscape of destruction, so don’t let anyone tell you that you can Save Planet Earth by switching off your lights for one hour a year. Sorry, that’s what I think about our chances of surviving climate change. But that doesn’t mean you shouldn’t do anything. Should you decide to “go green” or “go vegan” or “live off grid”, you should be doing it for your own health, sanity, personal reasons, or whatever. Will eating organic fruits and vegetables be better for you than eating tomatoes coated with toxic pesticides? Could doing so keep you healthier, longer, and out of hospitals? Probably. And that’s why you should do it – because you want to be the best you, to yourself, that you can be. Your vegetable garden is not going to save 7 billion humans, 8.7 million species of animals, nor the remaining 86 percent of animal life that we don’t even know about yet. It’s going to help you, quite possibly, and maybe a neighbor or two because you don’t infect their groundwater with toxic crap. But it is not going to save the world. I know I sound like a downer and a cynic. I get that. When was the last time a movement – of any size – was able to stop “them” from doing whatever they wanted? Remember the Iraq war protests? I did those; it had zero effect. 350.org rallies? Please. We are already at 450 PPM of CO2 in the atmosphere and it’s increasing daily. I am done with the big picture. I am moving on to something I can handle, on a daily basis, rather than just being pissed off, angry, and paranoid. I am going to control my environment, what goes in my body, what goes in my family’s body, and what products I use in my house. I will control how I travel (cars and trains only, no planes since 2007) and what kind of lightbulbs I use. But I no longer can put the effort into fighting pipelines that our “environmental” and Nobel Peace Prize-holding President will probably approve even though science says he shouldn’t. Money is power, and power always wins. Am I giving up? Yes, and no. This is an important topic because my belief is that if you try to solve everything, you will solve nothing. Trying to do everything often results in failure and a resumption of doing nothing. So while it’s (most likely) too late to stop climate change and thus the eventual demise of human life on Earth, it’s not too late for you to do what you can for your own life. Make that as comfortable, healthy, and safe as you can. Help out your friends. Do something for your community. Be a good person. Just don’t fall victim to being a depressed, off-the-wall, eco-terrorist against the billionaires in the world. You can’t win.